It’s a daunting thing, sitting down to write a review of a full-length Stephen King novel, for someone who hangs on every word the man has ever written. The problem is that remaining objective – reviewing the work at a remove, as it were – is next to impossible. Regular reader(s) of the blog will know that that isn’t the type of blog I run and will, I hope, forgive me a little hyperbole here and there as I work through the monster that is King’s latest novel, 11.22.63. The title of King’s latest novel is a reference to one of those dates that lives in the global consciousness as a day that defined the world in which we live. It may take a person a moment or two to parse the significance (especially since it appears in the US format of month, day, year), but it will come to them eventually. It is, of course, the date of the assassination of John F Kennedy, the 35th President of the USA. King’s premise is simple, a question that most people have pondered at some point: if you could go back and change it (save Kennedy, assassinate Hitler, etc. ), would you? Jake Epping is an English teacher in a small Maine town. When the owner of the local diner – a man Jake knows only from eating regularly in his establishment – calls him and invites him to the diner, he reluctantly goes. Al has aged overnight, a process exacerbated by the cancer that is killing him, cancer that he did not have the previous evening, when Jake last saw him. Al spins a tale – a hole in time in the pantry of his diner that will take Jake back to September 1958, a visit that, no matter how long Jake spends there, will only take 2 minutes of 2011 time – and asks Jake for his help: go back to 1958 under an assumed identity, get a job, kill time for five years, and be in Dallas in 1963 to stay the hand that slew Jack Kennedy. When Jake finishes his work in Derry, he moves ultimately to the small town of Jodie, Texas where he becomes a part of the community and falls in love with one of his colleagues, the new school librarian, Sadie Dunhill. It is here that Jake first decides that he might not want to return to 2011. It is, in his own words, when he “stopped living in the past and started living.” This love affair, of course, is fraught with peril for the man from the future, and King proves once more that no other writer puts their characters through the mill with quite as much élan as he does. The final section of the book deals with the run up to November 1963, and follows Jake as he watches Lee Harvey Oswald, attempting to close what he calls the “window of uncertainty” on whether Oswald was a lone shooter. As we move toward the event itself, King has a decision to make as to whether this was the case, or whether one of the many conspiracy theories about Kennedy’s death provides a better version of the truth, and it is interesting to see which road he chooses. Here, King is firmly in James Ellroy territory, and it shows in the tone of the narrative, even though 11.22.63 contains a more complete form of prose, a language that is unmistakably King. This section of the novel is littered with real people, and King does his best to make them his own, a sometimes difficult proposition with people as infamous as these. King has been very clever with his method of time travel, building some important rules into the process: the rabbit-hole always takes the traveller to the same time on the same date, so there can be no jumping back and forward through time when things get hairy. Time passes as normal in 1958 but, regardless of the duration, the traveller will only be gone from 2011 for two minutes. The most important, perhaps, is that each visit affects a reset, and any changes made during a previous visit will be lost. These three key rules play important – and sometimes devastating – roles throughout the novel. To make matters more difficult for Jake, the past becomes almost a sentient being. It is, Jake tells us, obdurate, and it also harmonises with itself. What this means is that, as Jake starts to move through the Land of Ago, we start to see connections between otherwise unrelated characters or events – characters that share the same, or very similar names, or faces, or personalities. We also come to see quite early on that the real city of Dallas and the fictional Derry are almost one and the same, with the same underlying malice defining them both. The obduracy is something that Al warns Jake of before his first trip, but it is Jake who discovers that the bigger the change, the more difficult it is to make. The past, we come to see, does not want to be changed, and this fact leaves us worried – if not outright frightened – of what Jake will face when he tries to change one of the world’s most defining moments. As with most of his novels, it seems that King finds it impossible not to drop self-references in to see who is paying attention, or to give Constant Reader a little thrill that they are getting more for their money than a King virgin (he has been doing it as far back as the early Castle Rock novels, seeding references to The Dead Zone into Cujo, for example). As always, it seems King is having immense fun with these “Easter eggs”. How about the late ‘50s red and white Plymouth Fury in the parking lot of the mill, the first car Jake sees when he steps back in time? The whole first section which seems, at first, to be a twenty-fifth anniversary tribute to one of King’s most divisive novels? There’s even a sly reference to The Dark Tower, when Jake sets eyes on a car called a Takuro Spirit, echoing Eddie’s observation in that alternate, Captain Trips-raddled version of Topeka, Kansas. And a tip of the hat to Ellroy’s own masterpiece in the form of a rogue FBI agent by the name of Dwight Holly. As you would expect from a man known for his love of pop culture (he had a regular column in the American magazine, Entertainment Weekly, called “The Pop of King” which he used to talk about books, films, music, entertainment in general), the attention to detail he applies to late-‘50s/early-‘60s America is second-to-none. Everyone smokes, and it’s the first obvious sign that Jake is in a world of a long time ago: the smell of tobacco smoke is ever-present, and there are very few characters who don’t smoke during their interactions with him or, at the very least, have a pack of cigarettes close to hand. King is careful to avoid anachronisms, but the world he has created is made more real by what we see around us – the products for sale in the shops, the cars on the roads, the very pollution being pumped into the air. It’s obvious that 11.22.63 required a massive research effort, not just in getting the details of Oswald’s movements right, but also in reconstructing the pop culture of the era. King takes it in his stride and the result is a world that feels as real in 1958 as it does in 2011. ‘Key’s inside the front door.’ Doe-ah. 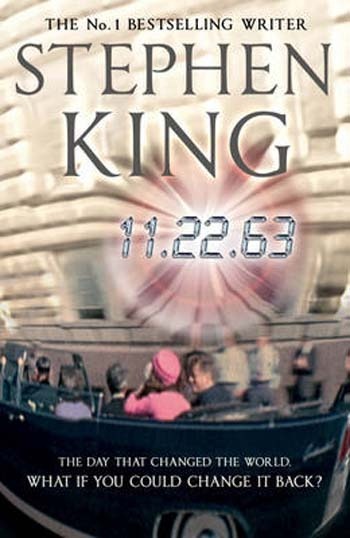 Reading a King novel is often like sitting on a park bench with an old-timer, listening as he spins his tales and spreads his gossip, and 11.22.63 is no exception. It’s a powerful novel, King’s considered answer to the question “if you could change it, would you?” What it boils down to, though, is that the events leading up to that fateful day play second fiddle to the more important personal relationship between Jake Epping, known in the Land of Ago as George Amberson, and Sadie Dunhill. But King is a man who enjoys unsettling his readers – it’s something he does very well, so why not? – so you can expect the course of this love to run not exactly true, as it comes up against the force of the obdurate past. 11.22.63 is the latest in a long line of masterpieces from a writer who, at the age of 63, is still at the top of his game, and still producing mammoth works at the rate of about one every year. It is a beautifully-imagined and wonderfully written story that will appeal to a wide range of readers. It’s easy to dismiss King as a “horror writer”, but horror is only a small fraction of what he has produced in a career spanning almost 40 years; it’s easy to forget that the man responsible for one of the masterpieces of modern vampire fiction – ‘Salem’s Lot – or the mother of all post-apocalyptic fiction – The Stand – is also the brains behind Shawshank Redemption and The Green Mile. It’s also easy to forget, reading as much as I do, just how brilliant a writer he is when I’m not reading him. 11.22.63 is a solid reminder of the fact that no-one tells a story like Stephen King does. A perfect read, more than deserving of its place on my Top 10 of 2011. Have had this on my bookshelf since my birthday, early last month. It won’t be sitting there much longer! Well worth bumping to the top of the pile. Enjoy! And thanks for visiting.